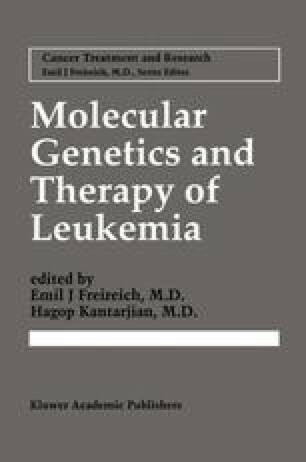 Remarkable progress has been made over the last five years in defining the molecular pathogenesis of the acute leukemias. Of the many leukemia-specific cytogenetic abnormalities that have been identified to date, structural lesions within the 11q23 chromosomal band are among the most common [1–4]. Translocations, deletions, and inversions within 11q23 have been detected in a variety of hematopoietic malignancies, including 7%–10% of the acute lymphoblastic leukemias (ALLs), 5%–6% of the acute myeloblasts leukemias (AMLs), and as many as 85% of secondary leukemias occurring in patients treated with topoisomerase II inhibitors [2,3,5–8]. Incidence rates of 11q23 translocations are strikingly high in infants (80% of ALL cases and 45% of AML), making these rearrangements the most common cytogenetic abnormalities in acute leukemias of this age group [9–11]. A number of different reciprocal chromosome bands have been shown to participate in balanced 11q23 translocations, including 1p32, 1q21, 2p21, 4q21, 5q31, 6q27, 7p15, 9p22, 10q12, 15q15, 16p13, 17q21, 19pl3, and Xql3, with the most common translocations being t(4;11)(q21;q23), t(9;11)(p22;q23), and t(11;19)(q23; p13) . Although some of these rearrangements are found almost exclusively in ALL (e.g., t(4;11)) or AML (e.g., t(9;11)), the majority have been observed in both myeloid and lymphoid leukemias, suggesting transformation of a pluripotent progenitor cell [1,12–16].